The White Sea is a southern inlet of the Barents Sea. It is on the northwest coast of Russia. It is surrounded by Karelia to the west, the Kola Peninsula to the north, and the Kanin Peninsula to the northeast. All of the White Sea is under Russian control and considered to be part of the internal waters of Russia. It is divided between Arkhangelsk and Murmansk Oblasts and the Republic of Karelia. The major port of Arkhangelsk is on the White Sea. It is an important Soviet naval and submarine base. The White Sea-Baltic Canal connects the White Sea with the Baltic Sea. The White Sea is one of four seas named in English after common colour terms. The others are the Black Sea, the Red Sea and the Yellow Sea. There are four main bays or gulfs on the White Sea. Kandalaksha Gulf is in the western part of the White Sea. It is the deepest part of the sea, reaching 340 metres (1,115 feet). On the south, Onega Bay receives the Onega River. To the southeast, the Dvina Bay receives the Northern Dvina River at the major port of Arkhangelsk. 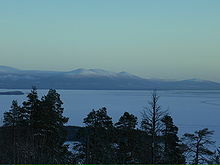 On the east side, opposite the Kola peninsula, is Mezen Bay. It receives the Mezen River and the Kuloy River. Other major rivers flowing into the sea are the Vyg, Niva, Umba, Varzuga and Ponoy. The seabed of the central part and Dvina Bay is covered in silt and sand. The bottom of the northern part, the Kandalaksha Gulf and Onega Bay is a mixture of sand and stones. The White Sea has a large number of islands, but most of them are small. The main island group is the Solovetsky Islands. They are almost in the middle of the sea, near the entrance to Onega Bay. Kiy Island in Onega Bay is important due to a historic monastery. Velikiy Island, close to the shore, is the largest island in the Kandalaksha Gulf. The sea has more than 700 species of invertebrates, about 60 species of fish, and 5 species of marine mammals. The fishing industry is small. They mostly target harp seal, ringed seal, herring, saffron cod, European smelt, Atlantic cod and Atlantic salmon. There is a developing seaweed industry. The White Sea is an important traffic centre of northwestern Russia. The White Sea – Baltic Canal links it through Onega Lake to the Baltic Sea and the major city and port of Saint Petersburg. The Baltic Sea, in turn, is connected by the Volga–Baltic Waterway to the Volga River, Black, Caspian, and Azov seas. The major ports on the White Sea are Arkhangelsk, Belomorsk, Onega, Mezen, Kem, Kandalaksha and Umba. Even though it is frozen in winter, boats can travel on the sea all year around because of the use of icebreakers. This page was last changed on 17 January 2014, at 20:15.